Intercontinental Hotels Group has signed a deal to manage a new 254-room hotel scheduled to open in Westminster in 2011. Intercontinental London Westminster will occupy the former Queen Anne's Chambers, which dates back to the 19th-century. Intercontinental Hotels Group has signed a 20-year contract with Splendid Hotel Group to manage the property, which will be its second hotel in London. Intercontinental's EMEA region president, Kirk Kinsell, said: "Despite the tough economic times, the fact that we continue to sign major deals is testament to the strength of our brands." 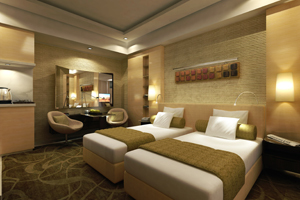 The hotel group is adding 5,000 rooms to its UK portfolio in the lead-up to the 2012 Olympics. Intercontinental London Westminster opening to "build on Olympics success"